Y.P.R. 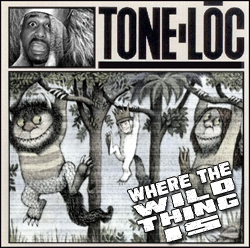 : Tone Lōc’s "Where the Wild Thing Is"
With fun like this, who has time to do homework? I roll up a few snowballs—and the rumpus begins. But then her boys done smashed my fort and made me a crier. It feels like a dream if you know what I mean in the land of the Wild Things. So I float my boat in a sea of funky cold medina. I was all alone, but now I’ve got my friends back. Might sound absurd, but haven’t you heard, that the sun is gonna die? So I taught the gang some brand new slang and became a Wild Thing. Before we gather in a great big pile and go to sleep for the night. But what do I expect? That’s whatcha get, when you fight, then sleep outside. Because deep down, despite her boyfriend, I really do love her. I wore a crown and played around in the land of the Wild Thing.